The other day I made a bean salad to take to a Sunday lunch at my aunt’s house for Mother’s Day. Sorry, no pictures. Sometimes I just completely forget that I am supposed to blog about the things I cook (hangs head in shame). It wasn’t anything spectacular. Just your typical bean salad…but it did have roasted red peppers and garlic, half of which I didn’t use and has been sitting in the fridge for a couple of days. Like I said before, I chopped and roasted the red pepper and garlic a few days prior. 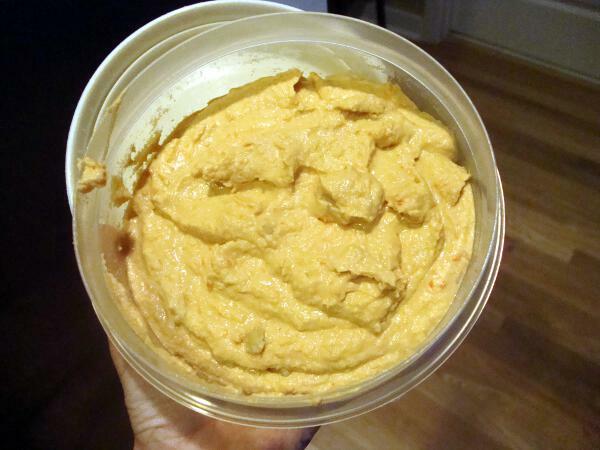 I added the chickpeas, red pepper and garlic, tahini, and lemon juice to my food processor. Then I added the reserved liquid from the chickpeas one tablespoon at a time, until it reached the consistency I prefer. I used three tablespoons. Then I salted, tasted, a bit, salted, tasted a bit, until it was just right. This recipe is very similar to my original hummus recipe. Plus a few minor alterations. This is hummus in my hand. I had been cooking up a storm that evening and couldn’t find a clear space on the counter to take a shot. Eventually I cleaned up a bit and since my hummus still had not made it to the fridge, I took this shot of it on the counter. Sorry, you don’t get a pretty picture in a pretty bowl. 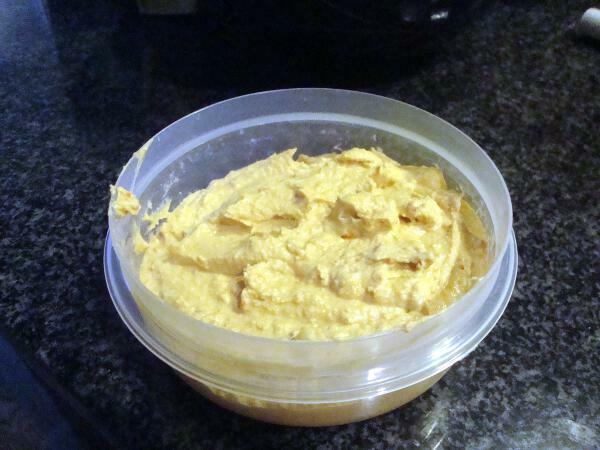 Hummus belongs in plastic ware. You may notice that this hummus contains no olive oil. It’s not because I’m afraid of fat (like so many blogs in the past few weeks have been talking about), but because I simply got distracted by something shiny forgot. It tastes pretty good without it and I guess I can add it in later if I want.